Background: Citicoline is able to potentiate neuroplasticity and is a natural precursor of phospholipid synthesis, or rather serves as a choline source in the metabolic pathways for biosynthesis of acetylcholine. Several studies have shown that it can have beneficial effects both in degenerative and in vascular cognitive decline. The aim of the present study was to review the pharmacokinetics and pharmacodynamics of this drug and its role in cognitive impairment according to the present medical literature. Methods: A MEDLINE® search was made using the following key words: citicoline, pharmacokinetics, pharmacodynamics, elderly, cognitive impairment, vascular dementia, and Alzheimer’s disease. Recent studies on the possible role of citicoline in increasing sirtuin 1 (SIRT1) expression were assessed. Some personal studies were also considered, such as the VITA study and the IDEALE study. Results: Administered by both oral and intravenous routes, citicoline is converted into two major circulating metabolites, cytidine and choline. It is metabolized in the gut wall and liver. Pharmacokinetic studies suggested that it is well absorbed and highly bioavailable with oral dosing. A number of studies have clearly shown the possible role of citicoline in cognitive impairment of diverse etiology. It can also modulate the activity/expression of some protein kinases involved in neuronal death and increases SIRT1 expression in the central nervous system. The VITA study and the IDEALE study suggested that both parenteral and oral citicoline are effective and safe. Other studies have clearly demonstrated citicoline’s effects on several cognitive domains. Conversely, some studies did not point out any evidence of efficacy of this drug. Conclusion: Citicoline appears to be a promising agent to improve cognitive impairment, especially of vascular origin. In fact, so far it appears as a drug with the ability to promote “safe” neuroprotection, capable of enhancing endogenous protective. Large clinical trials are needed to confirm its benefits. CDP-choline (cytidine-5′-diphosphate choline) is an endogenous compound normally produced by the body. When it is introduced as a drug, it can be called citicoline. Both in animals and in human beings, citicoline has been shown to possess proved neuroprotective properties.1–3 In clinical practice, a number of different studies have clearly shown that citicoline is effective in cognitive impairment of diverse etiology, cerebrovascular disease, head trauma, glaucoma, amblyopia, and Parkinson’s disease (PD). personal experience: the IDEALE study and VITA study. A number of evidences show that CDP-choline provides modest but consistent improvement in memory and behavior in cognitively impaired patients.1–3 One of the most critical points regards the relatively short term of clinical controlled observations, which in all studies but one lasted for no more than 3 months, too short a time for getting the best effects of citicoline; 6 months is the reported recommendation for getting the best outcomes. 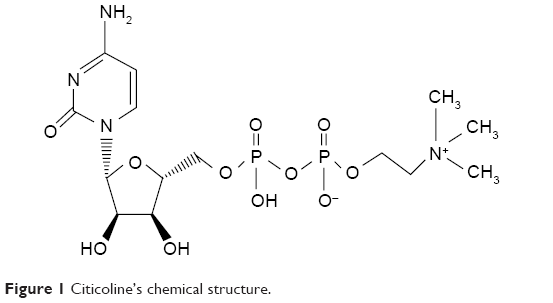 Figure 1 shows the chemical structure of this drug. It is composed of ribose, pyrophosphate, cytosine (a nitrogenous base), and choline. Figure 1 Citicoline’s chemical structure. The aim of the present study was to review the pharmacokinetics and pharmacodynamics of this drug and its role in cognitive impairment according to the present medical literature. A MEDLINE® search was made using the following key words: citicoline, pharmacokinetics, pharmacodynamics, elderly, cognitive impairment, vascular dementia, and Alzheimer’s disease (AD). We tried to focus the possible role of citicoline and why it should work in cognitive impairment. Pharmacokinetic and pharmacodynamic studies were also reported in order to better show the possible effects of chronic administration of this drug. Furthermore, recent studies have shown the very new perspectives, that is, the probable role of citicoline in increasing sirtuin 1 (SIRT1 = silent information regulator) expression, a protein with neuroprotective effects. Evidences from some personal studies were also considered, such as the VITA study10 and the IDEALE study.11 Finally, we have selected some studies in which citicoline has been shown to fail, trying to give possible explanations, especially when it was wrongly used; an appropriate research was also made on all the studies on its tolerability and safety. Figure 2 reports the metabolic pathways of citicoline. Figure 2 Citicoline’s metabolic pathways. it improves verbal memory functioning in older individuals with relatively inefficient memory. A multicentric, double-blind, crossover, randomized, comparative study vs placebo was sponsored by the Marketing Authorization Holder (MAH) Wyeth Lederle S.p.A. in 1998.2 This study was performed in 509 patients. Its aim was to assess the efficacy of CDP-choline 1,000 mg administered intramuscularly once a day in patients suffering from mild-to-moderate vascular dementia. The study showed significant differences in favor of active treatment over the placebo on delayed recall and memory index. Six 21-day cycles of treatment, with 21 days free of drug in between, three of these cycles with active treatment, and three with placebo treatment were carried on. A better efficacy was shown in a statistically significant proportion on Clinician’s Interview-Based Impression of Change (CIBIC) scale (P<0.0001). Advantages over placebo were also found on the emotional subscale of the Gottfries-Bråne-Steen Scale (P=0.006). As regards the safety concerns, no statistical differences were found in rates or types of adverse events in the patients treated vs placebo.2 The possible roles of CDP-choline were also assessed in patients affected by AD; however, one of the most significant limitations of these studies was their short duration. Cacabelos et al16 showed that the administration of CDP-choline 1,000 mg/day for 3 months in AD and multi-infarct dementia improved mental performance (assessed by MMSE and Hamilton Rating Scale for Depression). The possible explanations given by the authors were that CDP-choline can improve vascular risk factors and stabilize immune function. SIRT1 has been extensively studied in the context of several neurodegenerative diseases such as AD, PD, and Huntington’s disease (HD). Some interesting studies have also been done regarding amyotrophic lateral sclerosis (ALS), multiple sclerosis (MS), Wallerian degeneration, prion diseases, and cerebral ischemia.24 Since SIRT1’s effect in almost all the aforementioned diseases is shown to be protective in different animal and cell culture models, we can postulate that any drug able to activate SIRT1 might be beneficial in more than one disease type. The effects of CDP-choline on intracellular mechanisms of signal transduction confirm its key role in recovery after ischemic stroke. The “Studio di intervento nel decadimento vascolare lieve” (IDEALE study) was an open-label, multicenter, Italian study, the aim of which was to assess the effectiveness and safety of oral citicoline (1 g/day) in elderly people with mild vascular cognitive impairment. An assessment was made at baseline (T0), after 3 months (T1), and after 9 months (T2, in other words, 6 months after T1). The main outcomes were changes in MMSE, ADL, and IADL scores in the study group compared with the controls. Side effects were also investigated. The IDEALE study was one of the few trials conducted for a period longer than 6 months. A number of studies have shown that citicoline’s bioavailability is very good following oral administration.12,36,37 With regard to its mechanism of action, we suggest that the most pronounced benefits of treatment with citicoline are probably due to the activation of biosynthesis of phospholipids in neuronal membranes, the increase in brain metabolism, and the neuroprotective effects during hypoxia and ischemia. Furthermore, they are most likely to be accrued with prolonged use. This is confirmed by the positive results in our treated group and by the decrease in MMSE scores in the control group at only 9 months, after starting the study. Citicoline was shown to be effective in the complex geriatric syndrome complicated by confusion due to the worsening of general health conditions for the NIHSS during T1–T2, the Rankin Scale during T1–T2–T3, and ADL Scale during T1–T2. There was no significance in IADL scores. More specifically, in subacute ischemic cerebrovascular disease, administration of citicoline at the intravenous dose of 2 g in 500 mL of saline for 5 or 10 days has proven to be effective in improving functional independence and in reducing the burden of care. After 5 days (80% of cases), 10 days (20% of cases; T2), or 2 months (T3) since the beginning of treatment, there was an improvement in key measures of performance. This was more evident in the younger old-age groups. The most important and significant positive impact was evident in the results of the oldest age groups. No major side effects were recorded in any phase of the study.10 In conclusion, the results must cautiously consider the poor sample size, the short follow-up, and its features of being a retrospective and observational study. Furthermore, citicoline was not successful in another large trial, including poststroke patients.44 It was a randomized, double-blind, placebo-controlled, sequential trial performed in patients with moderate-to-severe acute ischemic stroke admitted at university hospitals in Germany, Portugal, and Spain.44 Patients were randomly assigned in a 1:1 ratio to receive citicoline or placebo within 24 hours after the onset of symptoms (1 g every 12 hours intravenously) during the first 3 days and orally thereafter for a total of 6 weeks (500 mg oral tablets twice a day given every 12 hours). The primary outcome was recovery at 90 days measured by NIHSS ≤1, modified Rankin score ≤1, and Barthel Index ≥95. Safety endpoints included symptomatic intracranial hemorrhage in patients treated with recombinant tissue plasminogen activator, neurological deterioration, and mortality. A total of 2,298 patients were enrolled in the study from 2006 to 2011. Of the 2,298 patients who gave informed consent and underwent randomization, 1,148 were assigned to citicoline and 1,150 to placebo. The trial was stopped for futility at the third interim analysis on the basis of complete data from 2,078 patients. Global recovery was similar in both the groups (P=0.364), and no significant differences were reported in the safety variables or in the rate of adverse events. The ICTUS trial showed that citicoline is not effective in the treatment of moderate-to-severe acute ischemic stroke.44 However, in both the studies, the time of administration was short. We postulate that citicoline’s neuroprotective effects should need a longer time of administration. CDP-choline (also named citicoline) has shown to possess beneficial physiological actions on cellular function. CDP-choline and its hydrolysis products play important roles in phospholipid synthesis and neuronal repair. Considering the great amount of published studies and assessing the pros and cons, it appears to be effective in cognitive impairment of any kind, especially of vascular origin. This result was also widely shown in our personal experience regarding the VITA study and the IDEALE study. The evidence is definitely strong, although limited by the duration of studies, so it would be appropriate to perform more long-term studies. It can be assumed that long-term treatment is safe orally, intramuscularly, and intravenously (500 mg–2 g/day) because serious side effects have never been reported. Furthermore, neither ECG nor EEG changes nor significant systemic cholinergic effects have ever been reported. Importantly, citicoline has been recently shown to increase SIRT1 protein expression and this is strongly involved in its neuroprotective actions. Some studies have shown poor results following citicoline administration, even if this could be due to its short time of administration. Also, it would be interesting to study whether the use of citicoline in association with cholinesterase inhibitors may help in delaying the progression of AD. It might be the possible target of future studies. Secades JJ, Frontera G. CDP-choline: pharmacological and clinical review. Methods Find Exp Clin Pharmacol. 1995;17(suppl B):1–54. Fioravanti M, Yanagi M. Cytidinediphosphocholine (CDP-choline) for cognitive and behavioural disturbances associated with chronic cerebral disorders in the elderly. Cochrane Database Syst Rev. 2005;18(2):CD000269. Hurtado O, Lizasoain I, Moro MÁ. Neuroprotection and recovery: recent data at the bench on citicoline. Stroke. 2011;42(suppl1):S33–S35. Grieb P. Neuroprotective properties of citicoline: facts, doubts and unresolved issues. CNS Drugs. 2014;28(3):185–193. Alvarez-Sabín J, Ortega G, Jacas C, et al. Long-term treatment with citicoline may improve poststroke vascular cognitive impairment. Cerebrovasc Dis. 2013;35(2):146–154. Secades JJ. Citicoline: pharmacological and clinical review, 2010 update. Rev Neurol. 2011;52(suppl 2):S1–S62. Alvarez-Sabin J, Roman GC. Citicoline in vascular cognitive impairment and vascular dementia after stroke. Stroke. 2011;42:S40–S43. García-Cobos R, Frank-García A, Gutiérrez-Fernández M, Díez-Tejedor E. Citicoline, use in cognitive decline: vascular and degenerative. J Neurol Sci. 2010;299(1–2):188–192. Fioravanti M, Buckley AE. Citicoline (Cognizin) in the treatment of cognitive impairment. Clin Interv Aging. 2006;1(3):247–251. Putignano S, Gareri P, Castagna A, et al. Retrospective and observational study to assess the efficacy of citicoline in elderly patients suffering from stupor related to complex geriatric syndrome. Clin Interv Aging. 2012;7:113–118. Cotroneo AM, Castagna A, Putignano S, et al. Effectiveness and safety of citicoline in mild vascular cognitive impairment: the IDEALE study. Clin Interv Aging. 2013;8:131–137. Secades JJ, Lorenzo JL. Citicoline: pharmacological and clinical review, 2006 update. Methods Find Exp Clin Pharmacol. 2006;28(suppl B):1–56. Franco-Maside A, Caamaño J, Gómez MJ, Cacabelos R. Brain mapping activity and mental performance after chronic treatment with CDP-choline in Alzheimer’s disease. Methods Find Exp Clin Pharmacol. 1994;16(8):597–607. Caamaño J, Gómez MJ, Franco A, Cacabelos R. Effects of CDP-choline on cognition and cerebral hemodynamics in patients with Alzheimer’s disease. Methods Find Exp Clin Pharmacol. 1994;16(3):211–218. Fernández-Novoa L, Alvarez XA, Franco-Maside A, Caamaño J, Cacabelos R. CDP-choline-induced blood histamine changes in Alzheimer’s disease. Methods Find Exp Clin Pharmacol. 1994;16(4):279–284. Cacabelos R, Alvarez XA, Franco-Maside A, Fernández-Novoa L, Caamaño J. Effect of CDP-choline on cognition and immune function in Alzheimer’s disease and multi-infarct dementia. Ann N Y Acad Sci. 1993;695:321–323. Alvarez XA, Mouzo R, Pichel V, et al. Double-blind placebo-controlled study with citicoline in APOE genotyped Alzheimer’s disease patients. Effects on cognitive performance, brain bioelectrical activity and cerebral perfusion. Methods Find Exp Clin Pharmacol. 1999;21(9):633–644. Bellizzi D, Dato S, Cavalcante P, et al. Characterization of a bidirectional promoter shared between two human genes related to aging: SIRT3 and PSMD13. Genomics. 2007;89(1):143–150. Donmez G. Sirtuins as possible targets in neurodegenerative diseases. Curr Drug Targets. 2013;14:644–647. Donmez G, Guarente L. Aging and disease: connections to sirtuins. Aging Cell. 2010;9:285–290. Ma CY, Yao MJ, Zhai QW, Jiao JW, Yuan XB, Poo MM. SIRT1 suppresses self-renewal of adult hippocampal neural stem cells. Development. 2014;141:4697–4709. Kim SH, Lu HF, Alano CC. Neuronal SIRT3 protects against excitotoxic injury in mouse cortical neuron culture. PLoS One. 2011;6:e14731. D’Aquila P, Rose G, Panno ML, Passarino G, Bellizzi D. SIRT3 gene expression: a link between inherited mitochondrial DNA variants and oxidative stress. Gene. 2012;497(2):323–329. Zhang F, Wang S, Gan L, et al. Protective effects and mechanisms of sirtuins in the nervous system. Prog Neurobiol. 2011;95:373–395. Donmez G, Wang D, Cohen D, Guarente L. SIRT1 suppresses beta-amyloid production by activating the alpha-secretase gene ADAM10. Cell. 2010;142:320–332. Donmez G, Outeiro TF. SIRT1 and SIRT2: emerging targets in neurodegeneration. EMBO Mol Med. 2013;5:344–352. Min SW, Cho SH, Zhou Y, et al. Acetylation of tau inhibits its degradation and contributes to tauopathy. Neuron. 2010;67:953–966. Donmez G. The neurobiology of sirtuins and their role in neurodegeneration. TIPS. 2012;33(9):494–501. Albensi BC, Mattson MP. Evidence for the involvement of TNF and NF-kB in hippocampal synaptic plasticity. Synapse. 2010;35(2):151–159. Donmez G, Arun A, Chung CY, McLean PJ, Lindquist S, Guarente L. SIRT1 protects against α-synuclein aggregation by activating molecular chaperones. J Neurosci. 2012;32(1):124–132. Polito L, Kehoe PG, Davin A, et al. The SIRT2 polymorphism rs10410544 and risk of Alzheimer’s disease in two Caucasian case control cohorts. Alzheimers Dement. 2013;9(4):392–399. Hurtado O, Hernández-Jiménez M, Zarruk JG, et al. Citicoline (CDP-choline) increases Sirtuin1 expression concomitant to neuroprotection in experimental stroke. J Neurochem. 2013;126:816–819. Grozinger CM, Chao ED, Blackwell HE, Moazed D, Schreiber SL. Identification of a class of small molecule inhibitors of the sirtuin family and NAD-dependent deacetylases by phenotypic screening. J Biol Chem. 2001;276:38837–38843. Hernández-Jiménez M, Hurtado O, Cuartero MI, et al. Silent information regulator 1 (SIRT1) protects the brain against cerebral ischemic damage. Stroke. 2013;44(8):2333–2337. Krupinski J, Slevin M, Badimon L. Citicoline inhibits MAP kinase signalling pathways after focal cerebral ischaemia. Neurochem Res. 2005;30(8):1067–1073. Lozano-Fernandez R. Efficacy and safety of oral CDP-choline. Drug surveillance study in 2,817 cases. Arzneimittelforschung. 1983;33(7A):1073–1080. Secades JJ. CDP-choline: update and review of its pharmacology and clinical use. Methods Find Exp Clin Pharmacol. 2002; 24(suppl B):1–53. Cacabelos R, Caamaño J, Gómez MJ, Fernández-Novoa L, Franco-Maside A, Alvarez XA. Therapeutic effects of CDP-choline in Alzheimer’s disease. Cognition, brain mapping, cerebrovascular hemodynamics, and immune factors. Ann N Y Acad Sci. 1996; 777:399–403. van Swieten JC, Koudstaal PJ, Visser MC, Schouten HJ, van Gijn J. Interobserver agreement for the assessment of handicap in stroke patients. Stroke. 1988;19(5):604–607. Lyden P, Brott T, Tilley B, et al. Improved reliability of the NIH Stroke Scale using video training. NINDS TPA Stroke Study Group. Stroke. 1994;25(11):2220–2226. Kasner SE, Chalela JA, Luciano JM, et al. Reliability and validity of estimating the NIH stroke scale score from medical records. Stroke. 1999;30(8):1534–1537. Sulter G, Steen C, De Keyser J. Use of the Barthel Index and modified Rankin Scale in acute stroke trials. Stroke. 1999;30(8):1538–1541. Zafonte RD, Bagiella E, Ansel BM, et al. Effect of citicoline on functional and cognitive status among patients with traumatic brain injury: citicoline brain injury treatment trial (COBRIT). JAMA. 2012;308(19):1993–2000. Dávalos A, Alvarez-Sabín J, Castillo J, et al; International Citicoline Trial on acUte Stroke (ICTUS) trial investigators. Citicoline in the treatment of acute ischaemic stroke: an international, randomised, multicentre, placebo-controlled study (ICTUS trial). Lancet. 2012;380(9839):349–357. D’Orlando KJ, Sandage BW Jr. Citicoline (CDP-choline): mechanism of action and effects in ischemic brain injury. Neurol Res. 1995;17:281–284. Dinsdale JR, Griffiths GK, Castelló J, Maddock J, Ortiz JA, Aylward M. CDP-choline: repeated oral dose tolerance studies in adult healthy volunteers. Arzneimittelforschung. 1983;33(7A):1061–1065.